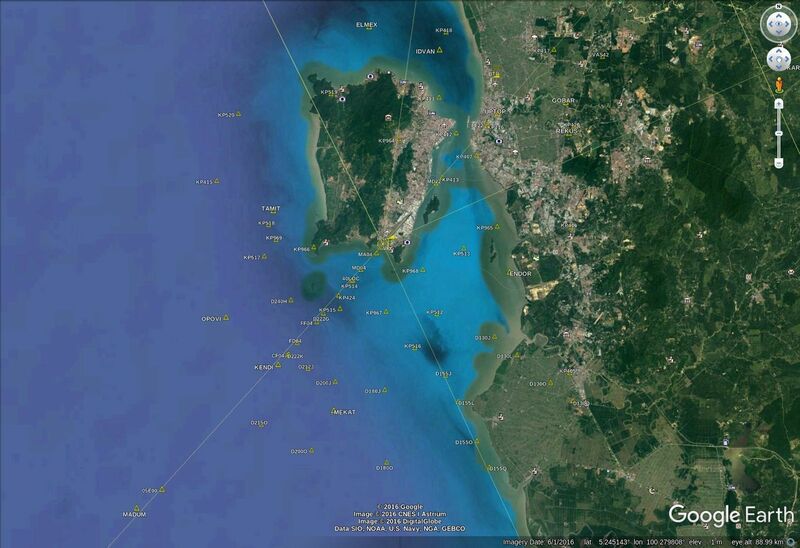 Aircraft Navigation Data Layer on Google Earth | Life, The Universe and ... Everything! I recently updated my FlightRadar24 subscription and realized you can download a .kml containing the flight track of any flight. 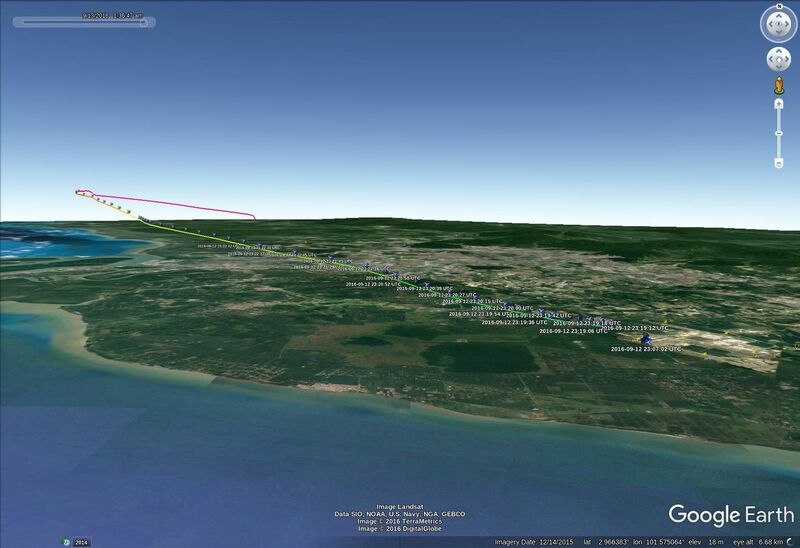 .kml files can be visualized in Google Earth, and since they also contain the altitude information, allow you to see a flight's progress in 3D. I found this user interface much easier to manipulate than FlightRadar24's web interface. 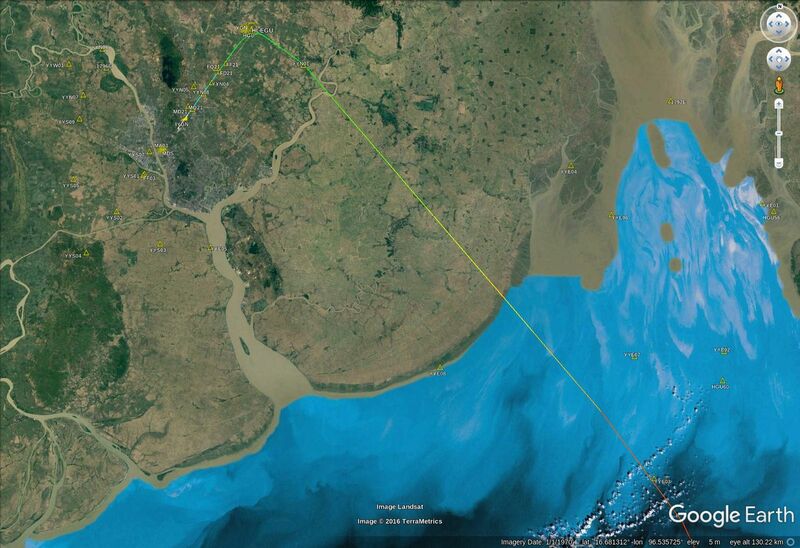 The only thing I missed was the NAVAids and airways that you can now add as an overlay on FlightRadar24. Since .kml is an open standard, and I have worldwide NAVAids data from my Navigraph subscription for my X-Plane Flight Sim, I decided to convert the Flight Sim navaid data into .kml format. I wrote a simple Perl script to parse the data and generate .kml files. Now .kml is just another XML layout, and the documentation here was helpful, as was studying other examples. I only needed to create Points (with icons) and Lines, so it was a relatively straightforward affair. You can associate Styles with Icons and Lines so that you can define the look-and-feel in one place. 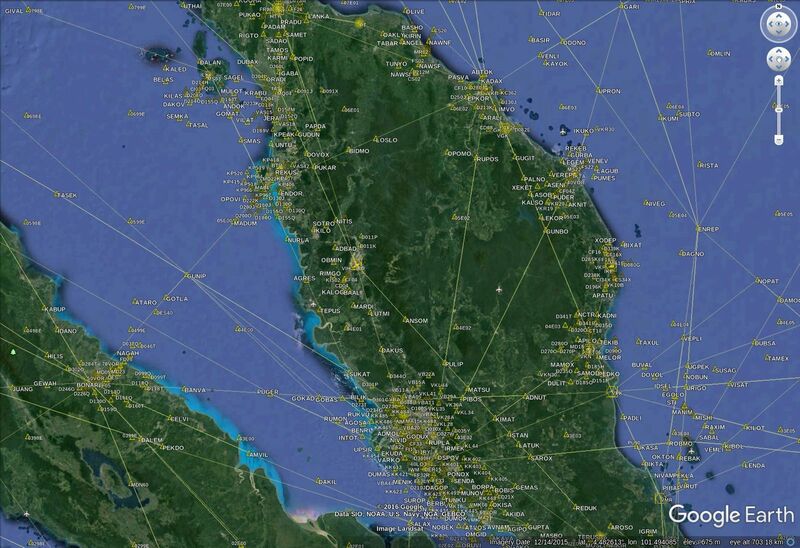 As for the NAVAids data, I used the dataset from the GNS430 GPS in X-Plane. This is located under Resources/GNS430/navdata for default data shipped with X-Plane. If you have a Navigraph Flight Data subscription, then you'll find a current dataset in Custom Data/GNS430/navdata. The files here appears to follow some pre-existing standard, as I found a .PDF online which details the file format (attached in case I lose the link). I managed to find some icons on the internet for VOR, VOR-DME, and also NDB. The navdata contains Glideslope positions also (but no localiser it seems) so I made my own symbol for that. I organized the fixes by country so that don't need to load all of them if you have a slow machine. Once generated you just drag the .kml files into Google Earth, and them cut-and-paste them from "Temporary Places" into somewhere under "My Places", so they will always be available. You can toggle them on and off using the tickbox as per any other Google Earth layer. 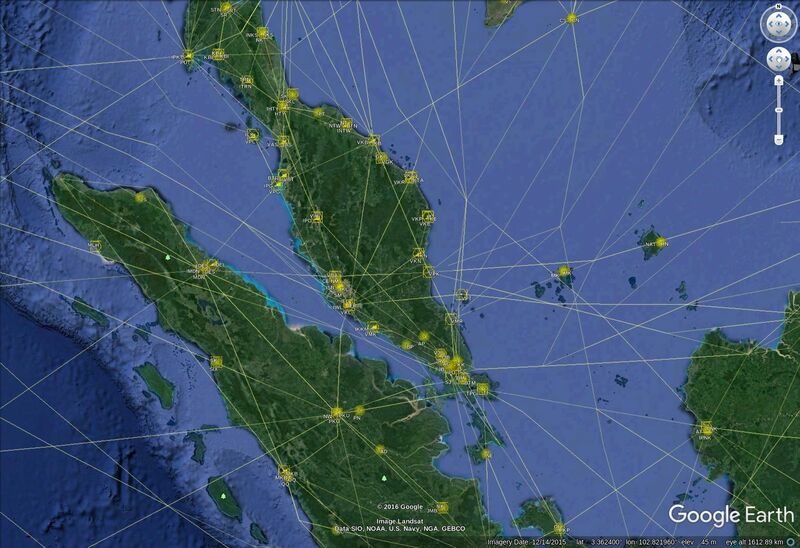 and here's what it looks like with flightradar24's .kml overlaid. With this it is much easier to study SID and STAR procedures and flight route being flown. As the navdata is copyrighted and the license forbids redistribution, I can't distribute the .kml files I've generated. However, you can download the latest version of my script from here. You can either use it with the stock X-Plane GNS430 dataset (even off a free trial-version of X-Plane, obtainable from here) or if you want the latest NAVData you can buy a one-off dataset from Navigraph for EUR6.50 from here (you don't even need X-Plane this way). To add labels on the airways, similar to how road names are labeled. To incorporate SIDS and STARs procedures. These are in the Proc folder in the NavData, and there's a description of how to parse them, but they are a lot more complicated than plotting Points and simple Lines, so will need further studying. It would also be nice if Google Earth's Search facility would some day search the .kml files under "My Places", so you could just type in the name of a NAVAid and be taken there straight away.